Going by train is often considered the only 'real' way of travelling. There is nothing quite like settling down in your own chair or compartment, and watching the landscape slowly change around you. Buying food from local vendors during intermediate stops, having dinner on board, or even the simple act of sleeping, it all somehow seems to be more adventurous when rail tracks are involved. 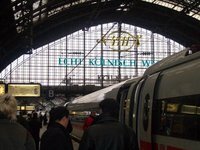 This article primarily aims at giving an overview, and collecting a set of very basic information on direct, international train connections. Connections are listed by continent, and then by pair of countries. More detailed information should not be included here, but should be listed in the 'getting there' sections of the respective countries. Visa information is not normally included. National long-distance trains should not be included. Even though Europe these days hasn't nearly as many international train connection as it used to a few decades ago, it can still boast the world's best railway connectivity (together with Asia). International trains used to be fairly expensive, but various operators are now starting to offer deals that, when booked in time, can rival with plane tickets on many connections. Detailed information on European train connections can be obtained from the International Journey Planner, hosted by Belgian B-Rail. An excellent page on border lines in Europe can be found here. More information on EUrail and Interrail, the European railway passes, can be found here. Most passenger train connections in South America have gone bankrupt over the past 20 years, due to which busses are cheaper, more frequent, easier and more comfortable on most connections. Nevertheless, there are a few worthwhile (international) connections to take for the more enthusiastic train addicts. Although technically it is not an international train, the Death Train serves the Bolivian city of Santa Cruz with the border of Bolivia with Brazil. There are several ways of getting from Santa Cruz eastwards toward Puerto Suarez and vv. Connections are daily and there are a number of trains you can take: normal, express or ferrobus services. There are no notable intermediate stops on the way but the 24 hour trainride serves as a good option for travellers to and from Brazil. The border is at Quijarro where you can cross into Brazil at Corumba. There is a train between Uyuni in Bolivia and Calama in Chile. Although there are better ways to travel between the two countries, like a trip between San Pedro de Atacama and Uyuni, this train offers one of the rare occasions for enthusiasts to travel between two countries in South America. It leaves once a week and should take about 24 hours, although delays are not unheard of. Bring sufficient food and drinks and some warm clothing as temperatures plumid during the night. Although like the Death Train, it is not an international connection, the Tren de las Nubes (lit. 'train of the clouds') connects the city of Salta in northwestern Argentina with the border of Chile high in the Andean mountains. The train leaves once a week and takes about 15 hours to complete the whole journey. Due to several problems the train hasn't been running for a few years, but service is scheduled to be resumed in 2008. Asia probably is one of the best continents to travel by train and for overland travellers from Europe there are several possibilities of travelling all the way to Singapore almost entirely by train. Only through Cambodia, certain legs of your trip you have to travel by bus and/or boat. Although Moscow is the most obvious starting point for these epic train journeys, there are several other places to start your trip as well, like Istanbul. The Trans-Siberian Railway is one of those journeys that every traveller would like to make sometime during their life. Besides the 'original' that runs from Moscow to Vladivostok (and is not technically an international train), the southern trans-Mongolian branch takes you through Mongolia to China. For more information and details about possible trains to take check the Trans-Siberian Railway page. Taking the train between Beijing (China) and Pyongyang (North Korea) is an option, but not as an individual. You have to arrange it with a travel agency and be part of a tour group. Most tours have tourists fly one way, for example with Air Koryo, and then take the train the other way back. Trains leave Pyongyang for Beijing at Mondays, Wednesdays, Thursdays and Saturdays around 10am. From Beijing trains leave on the same days at around 5.30 pm. It takes 24 hours in both directions, including formalities at the border towns of Sinuiju (North Korea) and Dandong (China). There is even one train a week between Moscow (Russia) (Yaroslavski station) and Pyongyang, usually leaving on friday (Moscow) or Saturday (Pyongyang) and it takes a week to complete the entire journey. There are two trains a week connecting Almaty in Kazakhstan with Urumqi in China. On Mondays and Saturdays, trains leave Almaty at 10.40pm, arriving in Ürümqi on Wednesdays and Mondays at 7 in the morning. From Ürümqi, trains depart just before midnight at Mondays and Saturdays, arriving in Almaty on Wednesdays and Mondays around 10.30am. There are several direct trains between Ulan Bator (Mongolia) and Beijing (China) every week. It is best to book the tickets in advance because they tend to sell out, especially in the summer time. There are 2 trains a week between Hanoi (Vietnam) and Beijing. Trains from Hanoi leave on Tuesdays and Fridays at 6.30pm, and arrive two days later at 1.30pm at the Beijing West train station. From Beijing trains depart on Sundays and Thursday around 4pm, arriving early in the morning at around 8 o'clock in Hanoi. The journeys requires a train switch at the border town of Dong Dang. Other intermediate stops include Nanning, Guilin and Zhengzhou, all in China. There are two routes routes between Moscow (Russia) and Beijing (China): the Trans-Mongolian and the Trans-Manchurian routes, both of which are southern branches of the better-known Trans-Siberian Railway. The first goes via Ulan Bator, cutting across Mongolia and then into China. It leaves Moscow every Tuesday night, taking about 6 days to reach Beijing. The second cuts into northern China at Manzhouli and continues to via Harbin. It leaves Moscow on Friday night and takes about 6 days as well to cover the distance to Beijing. For more information look at the article: Trans-Siberian Railway or check the Timetable directly for exact schedules. There is train every second day between Moscow and Almaty (Kazakhstan), leaving Moscow at 10:30pm and arriving at day 5 early in the morning in Almaty. From Almaty, trains leave around 7.30am, arriving the 4th day at around 10:30am. Check this site for schedule details. Two trains a week link the capitals of Russia and Kyrgyzstan. From Moscow, trains leave on Thursdays and Sundays at 11.15pm, arriving in Bishkek on Mondays and Thursdays at 2:30am. Trains leave Bishkek around 10 in the morning on Mondays and Thursdays, arriving in Moscow on Thursdays and Sundays just after 3:00pm. There are three trains a week between Moscow and Tashkent (Uzbekistan). Trains leave Moscow on Mondays, Wednesdays and Fridays at 11:15pm, arriving 3 days later at 7:15pm in Tashkent. In the opposite direction, trains depart from Tashkent at around 7:00pm on Tuesdays, Fridays and Sundays, arriving in Moscow 3 days later just after 3:00pm. Daily trains run from Aqtöbe, Aralsk, Kyzylorda and Turkistan (all Kazakhstan) to Tashkent via the border at Saryagash. Coming from Almaty you can transfer at the trains at Arys, 60 kilometres west of Shymkent. Another rail crossing exists between Beyneu, western Kazakhstan, and Kungrad, Uzbekistan. Daily trains run from Beyneu to Kungrad (10 hours) and on Saturday and Wednesday, there is a train via Beyneau coming from Saratov (Russia) via Atyrau (Kazakhstan), continuing to Tashkent via Nukus and Samarkand. Although technically only the famous (and expensive!) Orient Express travels directly between Bangkok and Singapore once a week, travelling by train between these two destinations is a blessing and much more comfortable than taking the bus again. You have to break up your journey at least once in Butterworth from where there are ferries to the island of Penang. From Singapore there is one daily train to Butterworth, where you have to spend the night, before travelling to the southern Thai city of Hat Yai, where you have to change trains again for Bangkok. Between Singapore and Kuala Lumpur there are 3 trains a day, one of which is a sleeper train. It takes 6.5 hours during the day and 9 for the sleeper. In the other direction, strangely enough, the train from Bangkok travels directly to Butterworth in Malaysia. From here there are 2 daily trains and 1 night train to Kuala Lumpur, with onward connection to Singapore again 3 times a day, of which one is a sleeper. Currently there are several cities with trains to the Tibetan Autonomous Region. There is a plan to extend the train line all the way to Xigaze. Remember for foreigners to purchase a train ticket to Lhasa they must have all the proper permits. In order to get the proper permits one must contact a travel agency. Beijing to Lhasa, 1 train a day. Shanghai to Lhasa, 1 train a day. Xi'an to Lhasa, several trains a day depending on the time of the year. Lanzhou to Lhasa, several trains a day depending on the time of the year. Xining to Lhasa, several trains a day depending on the time of the year. Golmud to Lhasa, several trains a day depending on the time of the year. Chengdu to Lhasa, 1 train a day depending on the time of the year. According to plans, trains are running again since late 2007 between Calcutta in India and the capital of Bangladesh, Dhaka, for the first time in over 40 years. Although there were connections from Calcutta to the border and across the border further to Kulna, there weren't any connections to Dhaka at all from the west. This direct option takes about 12 hours including border formalities. Karachi to Jodhpur - Since February 2006, a train travels between the Indian city of Jodhpur in Rajasthan and the coastal city of Karachi in Pakistan. It's the first international train travelling directly between the two countries since 1965. The Thar Express leaves Karachi at 11:00pm on Fridays, taking almost 24 hours before arriving in Jodhpur on Saturday evening. In the opposite direction, trains leave and arrive on approximately the same time on the same days taking 24 hours as well. Lahore to Amritsar - On Mondays and Thursdays the Samjhota Express leaves Amritsar at 7:00am, scheduled to arrive in Lahore in Pakistan just after 2:00pm. In the other direction, trains leave Lahore on Tuesdays and Fridays at 8:30am to the Indian town of Atari, from where there are connections to Amritsar, arriving at 3:00pm. The Trans-Asia Express travels on a weekly schedule between the gateway to Asia, Istanbul, and the capital of Iran, Tehran. Trains leave Istanbul Wednesdays at around 11pm and arrives in Tehran about 70 hours later. In the opposite directions, trains leave Tehran Thurdays around 6.30pm and take about the same time. The trainride is divided into two parts, one from Istanbul to Lake Van and one from Lake Van to Tehran and only one carriage actually is moved over the lake to make the entire journey. Every Sunday around 9am, a sleeper train leaves Haydarpasa station in Istanbul for the Syrian city of Aleppo, arriving on Mondays around 2pm. In the opposite direction the train leaves Aleppo station on Tuesdays around 11 am, taking over 30 hours to reach Istanbul early evenings on Wednesday. A twice weekly train travel between the capital of Syria, Damascus, and the capital of Jordan, Amman. The train leaves both places on Mondays and Thursdays at 8 o'clock in the morning and take 9 hours to complete the schedule. Although slower than buses and shared taxis, this train ride comes as a welcome alternative for train fanatics. There is a weekly train travelling from Damascus to Tehran, stopping in Aleppo in Syria and Tabriz in Iran along the way. Like the train from Istanbul to Tehran, the journey contains two stages, one to Lake Van and one from Lake Van onwards. Africa doesn't come to mind at first regarding some fine international trains to take, but there are indeed several fine opportunities to travel between countries by train. Theoretically, a weekly train travels between the capitals of Senegal and Mali. The train is supposed to leave Dakar on Saturdays around 10:00am, arriving in Bamako just under 48 hours later. In the opposite direction, the train leaves Bamako on Wednesdays at 9:15am, taking about the same amount of time. Because of works on the railway, the train now (since 2008) leaves every 8 or 9 days and there is no fixed schedule at the moment, so ask around in both cities when the next train is supposed to leave. Trains travel between Djibouti City and the Ethiopian city of Dire Dawa. Trains leave three times a week in both directions and it takes around 13 hours to cover the route. Since 2006, there is a thrice a week train between Francistown in Botswana and Bulawayo in Zimbabwe. The train leaves Francistown on Tuesdays, Thursdays and Saturdays around 9:00am and arrives approximately 6 hours later in Bulawayo. In the other direction, the train leaves Bulawayo at 9:30am on Mondays, Wednesdays and Saturdays, taking 5 and a half hours. Centrally located in Zambia, north of the capital Lusaka, Kapiri Mposhi is the starting point of a two nights trainride to Dar es Salaam on the Tanzanian coast. From here you can travel further by boat or plane to the tropical island of spices, Zanzibar. This so called TAZARA Railway (Tanzania-Zambia Railway) operates scheduled services twice a week, leaving in both ends of the line on Tuesdays and Fridays around 16pm, arriving on Thursdays and Sundays at 9:30am in Zambia, but after noon in the other direction in Dar es Salaam. The train journey from Malawi to Nampula is one of the few remaining great train journeys in Africa. The scenery is stunning, the track passes between towering inselbergs and in 2nd class its comfortable enough with waiter service, reserved seating and the option to reach out the window to buy from people with baskets of food at the many stations. It runs in each direction on alternate days except Monday: Nampula to Cuamba on Tuesday, Thursday and Saturday, and Cuamba to Nampula on Wednesday, Friday and Sunday. 3rd class costs M175, second class M331, and there's no first class. The train departs at 05:00 every day (except Monday) and takes 10-12 hours. You need to book the day before. The journey is from Cuamba to Nampula (all within Mozambique) meaning that you have to make the border crossing to/from Malawi by local chappa and bicycle and thats lengthy. There is a regular overnight train service with TransNamib, the national railway company of Namibia, from Upington in South Africa to Windhoek in Namibia via Keetmanshoop. The total trip takes about 26 hours. Although the domestic service from Keetmanshoop to Windhoek rides every day except Saturdays, the train between Upington and Keetmanshoop only rides on two days: from Upington on Sundays and Thursdays at 5:00am arriving 11 and a half hours later in Keetmanshoop and from the latter on Wednesdays and Saturdays around 9 am, taking well over 12 hours to reach Upington in South Africa's Northern Cape Province. Although both Canada and the United States have extensive rail connections, especially the latter, there are surprisingly few international connections between the two. In the northeast of the continent however, several train rides might be of some use to overland travellers. Also in the west, between Washington state and British Columbia in Canada, there is a pleasant ride as an alternative to the bus. New York to Montreal - There is a daily train connecting New York with Montreal. It leaves New York around 8:00am, arriving in the early evening in Montreal. In the other direction, the train departs Montreal at 10:00am, arriving in New York at 7:30pm. New York to Toronto - A daily train travels from New York at 7.15 am to Toronto, arriving at 7:40pm. It also stops at the Niagara Falls, on the American side, roughly 3 hours from Toronto. From Toronto the train departs at 8.30am and arrives in the Big Apple before 10pm. Seattle to Vancouver - There are 5 trains a day between Seattle and Vancouver, usually two in the morning, one around noon and two again in the late afternoon or early evening. It takes around 3.5 hours to complete the trip. This is version 80. Last edited at 12:40 on Dec 7, 17 by Utrecht. 7 articles link to this page.